My family never tires of spaghetti and red sauce, but I do. So I created today’s dish to be a quick & easy alternative to the same old pasta. The cream sauce was my idea of a happy medium. It’s much lower in fat and sodium than a traditional alfredo, but adds a ton of flavor as well as a modest measure of decadence. The basic recipe really lends itself well to improvisation. I’ve made it as detailed below, but I’ve also added sauteed shrimp to the mix, and it’d be equally great with some no-salt-added canned tuna or salmon. But why stop there? Try adding some additional veggies, such as green peas. Or along with the roasting asparagus, throw in some thinly sliced lemon, shelled edamame, snowpeas, or…? The possibilities are endless. When tossed with a whisper of cream sauce, a touch of citrus, garlic, onions and fresh dill, a little grated Parmesan cheese and black pepper.. OOoh!! It’s my idea of spring! Bring a pot of water to boil and cook pasta according to package directions. While pasta is cooking, preheat oven to 450 degrees. Line a baking sheet with aluminum foil. Wash asparagus, trim the bottom of each stalk and discard. Cut the stalks into 2-inch pieces and place in a mixing bowl. Add the olive oil, lemon juice and freshly ground black pepper to taste; toss well to coat. Turn the contents out onto the prepared baking sheet and arrange the asparagus in a single layer. Place sheet on middle rack in oven and roast 10 minutes. In a saute pan, melt 2 T. of the butter over medium heat. Add the onion and garlic and cook, stirring, until softened. Set aside. Prepare the sauce. 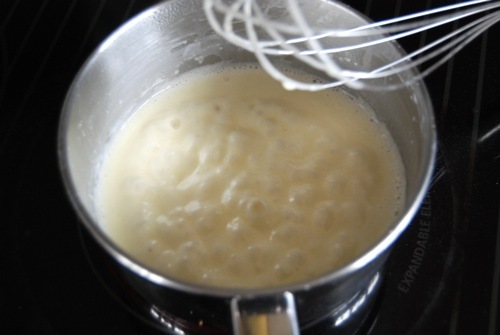 Measure the heavy cream, 1 T. butter and 1/8 c. Parmesan cheese into a small saucepan over medium heat. Whisk to combine until butter melts. Bring to a simmer. Once simmering, reduce heat to low and simmer 1 minute, whisking once or twice. Remove from heat. Drain pasta and add to the saute pan with the onion and garlic. 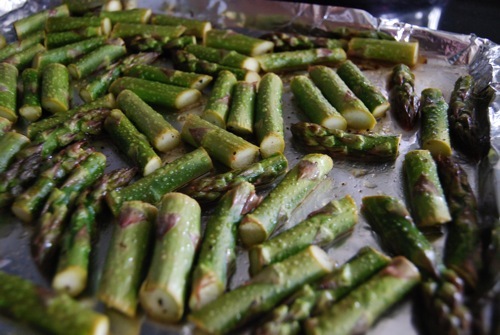 Remove roasted asparagus from oven and add to saute pan as well, along with all roasting juices from the baking sheet. Pour the cream sauce into the pan, along with the remaining 1/8 c. Parmesan cheese and fresh dill. Stir to combine. Season with freshly ground black pepper to taste. Serve immediately. Yummyyyyy. Of course this thing is begging for some sausage in my mind, but I can see how shrimp would be perfect for a non-fish-hater. And that cream sauce? All of my favourite things. Maybe if I make it with whole wheat pasta and tell him it’s skim milk instead of heavy cream, I can convince Kamran to eat it. I love pasta! But then, I love asparagus, too… so this times-out really well for me! That’s my ‘trying to make it look like I have the first clue’ word-o-the day. Hey! I hope you both try this one. I just ate the leftovers for lunch and they were so GOOD. I bet it’d be great with whole wheat pasta. 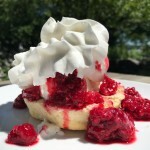 I would have gone that route (so much healthier) but I have a dickens of a time getting my kids to eat it. 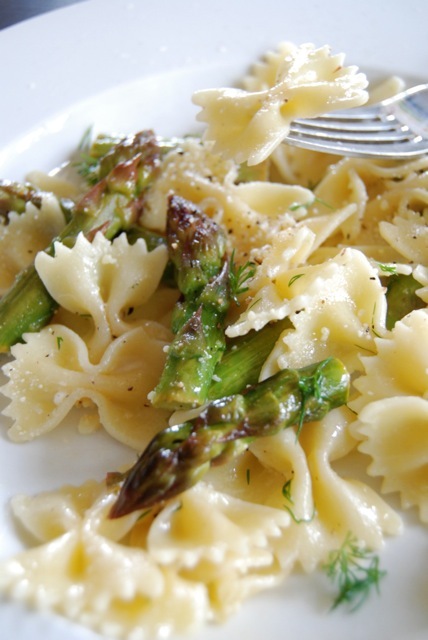 Asparagus is just coming into season here and I am definitely making this for my dinner on Friday. Thanks! I am more of a whole grain pasta kind of guy so I’ll see how this works with that. Wonderful, Will!! Keep us posted!! Perfect timing. All my local grocers are featuring fresh California grown asparagus this week. 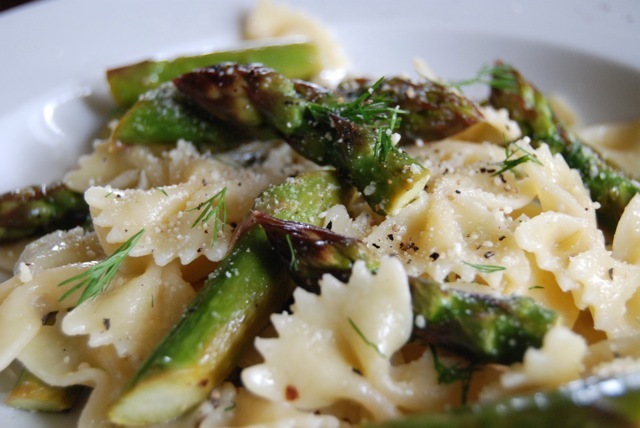 I love roasted asparagus, and farfelle is one of my favorite pastas. (my other favorite is orzo). I love your sauce recipe. You’re right, it could be used in many, many applications. And I always have heavy cream on hand too. I’ve found that when I have a bland sauce (because of the lack of salt), a bit of cream adds a richness that compensate for the missing salt. 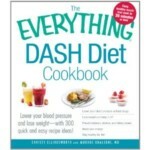 And heavy cream lasts a long time in the fridge because of the high fat content. The only problem with your recipe is the suggested servings. I honestly think my husband and I could finish off the entire pound of bow ties & asparagus in one sitting. Yes, we love pasta! Hah!! Shambo – I was *just* over at your place!! I like to keep heavy cream on hand too — it’s a big indulgence but if used sparingly, not a bad thing at all. I absolutely LOVE the sound of your noodle salad. SO excited to try!! I don’t have low-so soy sauce but will try substituting Bragg Liquid Aminos instead. Just have to find the noodles & get some sprouts and I am SET!! WOOT!! I so soo loved this Recipe of yours Christy…I love pasta so much but I don’t like asparagus but because of your recipe I love it now and Even though there’s no salt the taste is awesome. I’ve learned lots from your site offering low sodium recipes this are so good for everybody….. By the way I want to ask too instead using Farfelle (bow tie) pasta can we use noodles or other pasta? Thanks! Hi Susan!! 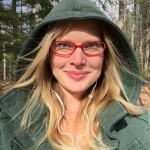 I’m thrilled to hear you’re loving the site and (now) asparagus!! Hooray! You can of course use whichever pasta you prefer or have on hand. PS: so sorry for the laaaaaate response – how do I miss these comments and only catch them months later??! Tried this when my son was home for Christmas and everyone loved it! I sauted large shrimp and added it to the mix….delish!